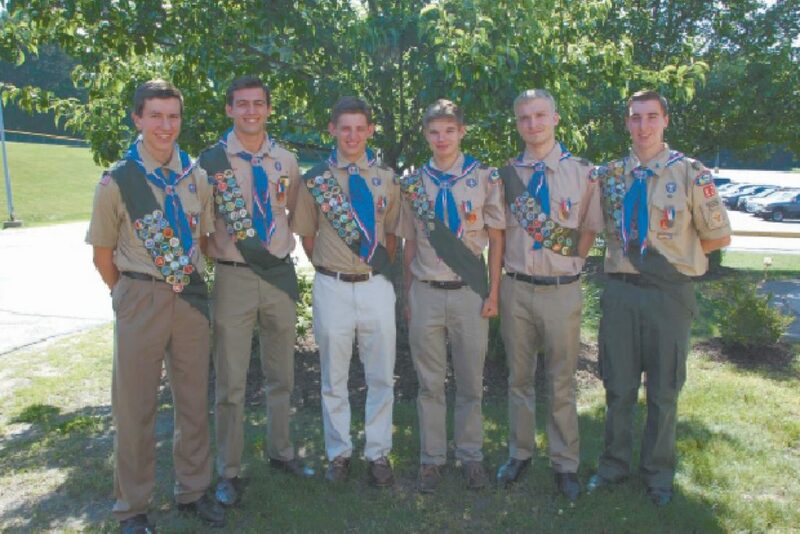 Courtesy photo Pictured, from left, are the newest Eagle Scouts from Hollis Boy Scout Troop 12, including Adam McQuilkin, Sam St. Pierre, Jack Belanger, Kyle Swanson, Ben Thyng and Grant Partin. HOLLIS – Statistics show that of any 100 boys that become Scouts in America, only four will reach the prestigious rank of Eagle. The road to Eagle is long and challenging, involving many years of community service, demonstrated leadership, merit badge and rank requirements, camping, hiking and a significant service project, which must benefit the community. Hollis Troop 12 is proud to announce the following young men have met – and exceeded – these requirements and were recently promoted to Eagle Scout: Jack Belanger, Adam McQuilkin, Grant Partin, Sam St. Pierre, Kyle Swanson and Ben Thyng. The Eagle Court of Honor for them was held in Hollis and was recognized by the New Hampshire Senate, state Congress, Hollis Board of Selectmen, Veterans of Foreign Wars and the president of the United States’ Cabinet. The Scouts also each received a U.S. flag flown over the Nation’s capitol, honoring their achievement. As a testament to the Scouting program, these fine young men contributed a combined total of 593 hours of service to the community. Adam, Jack, Sam, Kyle and Ben also all attended National Youth Leadership Training at Camp Bell in Gilmanton. The camp is a six-day, intense leadership training program delivered in a troop and patrol outdoor setting with an emphasis on immediate application of learning in a fun environment. The overall course centers on what a leader must be, what he must know and what he must do. Of the 21 required merit badges, Jack Belanger earned 23. He also served in various leadership roles for the troop, including patrol leader and scribe. The beneficiary of Belanger’s Eagle Project was the Hollis Parks and Recreation Department. He created two recycling units for Nichols Field in Hollis. Originally, there were only random trash bins placed around the park and at big events the bins would overflow very quickly. Each new, labeled unit consists of a trash, plastic and cans bin. Some of the older bins were also repurposed into the newer bins, and arrangements were made with the Department of Public Works to pick up recyclable trash. Jack reached 50 nights of camping and hiked 100 miles throughout his Scouting years. Adam McQuilkin also earned 23 merit badges and held leadership positions at the patrol leader and webmaster leader level. Adam’s project was to modernize and upgrade the public use cabins at Beaver Brook Association in Hollis. The project benefitted Beaver Brook in several ways, including the addition of a new cabin ceiling, waterproofing and repairing a porch, repairing a cabin foundation, and building and installing new access doors. Adam participated in the mile swim and reached 50 nights of camping throughout his Scouting journey. Grant Partin earned an impressive 30 merit badges and held leadership roles at the patrol leader and senior patrol leader level. Grant actually served as the troop’s senior patrol leader for two years. This position requires the most commitment of all the leadership roles, as the Scout is required to lead the entire troop, not just an individual patrol within the troop. Grant did a great job in this role and the troop is thankful for his service. Grant’s Eagle project was to construct a 20-foot bridge over a seasonal stream for the Gelazaukus Preserve on Nartoff Road in Hollis. He led a crew that cleared a 400-foot trail near the site of the bridge to connect two parallel trials. This allows people to more thoroughly enjoy the Gelazaukus preserve by being able to circumvent a previously washed out section of the trail. Grant participated in the mile swim and reached 50 nights of camping over the course of his Scouting career. Sam St. Pierre earned 21 merit badges and served as patrol leader, assistant senior patrol leader, historian and webmaster for the troop. Sam’s Eagle Project was to renovate the landscaping around the Parsonage Home in Hollis. During the Fall of 2015, he led a landscape crew to remove several overgrown bushes and plants and added a crushed-stone drip-edge around the foundation. He went back in the Spring of 2016 and completed the project by adding new plants and fresh mulch. The project benefited the Hollis Congregational Church by creating a low-maintenance, visually appealing landscape for future residents of the home to enjoy. Overall, St. Pierre provided a remarkable 211 hours of community service throughout his years in Scouting and hiked over 100 miles. Kyle Swanson earned 24 merit badges and served as a patrol leader, assistant senior patrol leader, quartermaster and chaplain’s aide. Kyle’s Eagle Project was to build three traditional-style picnic tables from a mix of lumber and composite materials, in addition to the construction of an octagonal picnic table. The project benefited the Beaver Brook Association by providing them with new and lasting tables that could be utilized by summer camps and public use. Kyle participated in 25 service projects, hiked a whopping 200 miles and reached 75 nights of camping over the course of his Scouting years. Ben Thyng earned 23 merit badges and held leadership roles as patrol leader, assistant patrol leader and troop guide. Ben’s project was to design, construct and install a trailhead kiosk at the Beaver Brook Association’s Old City Trail where it meets Rocky Pond Road in Hollis. Ben also assembled and placed two benches at the trailhead and at the site of an historic mill near the trailhead. This project benefits both the Beaver Brook Association and the Hollis Conservation Commission. Ben also participated in 25 service projects, reached 50 nights of camping and hiked a record 200 miles as well. Congratulations to these fine young men and best of luck on what we know will be a bright future! 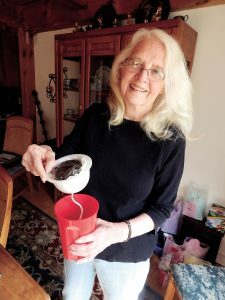 The Colonial Garden Club of Hollis seeks plant donations.